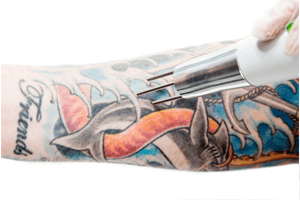 Lets Know What Makes A “Tattoo Removal Specialist”? 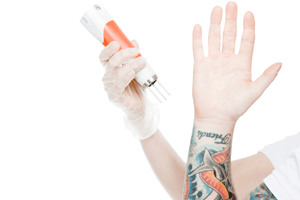 BlogHome » What Makes A “Tattoo Removal Specialist”? At a Tattoo Removal Clinic, the only procedure that is performed is that exactly… tattoo removal. Each and every day the ‘specialists’ will use their expertise and ever increasing experience to gain the very best results for each individual client. 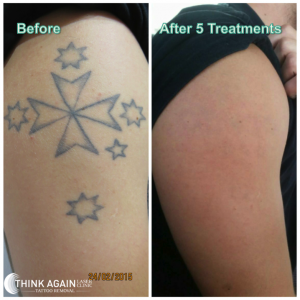 At Think Again Laser Clinic Sydney we perform tattoo removal on at least 50 clients per week. We pride ourselves on being the leaders in the industry and this is why our clients make the educated choice to be treated by our specialists. Media examples have been shared of beauty clinics in Sydney who are treating “10-12 patients a week”. At a beauty clinic, their focus will not be on performing laser tattoo removal; rather it is spread across many unrelated treatments and procedures. With that in mind, would you choose to have your first tattoo done by someone with a ‘little’ or ‘a lot’ of experience? At Think Again we do not provide laser hair removal, waxing, cosmetic injections, facials, wrinkle reduction or any skin rejuvenation procedures. We only provide the service you ultimately require- laser tattoo removal. Ensuring the latest and most advanced technology is used is another crucial element, which ensures you are being treated by a specialist. Not all tattoo removal lasers are made equal and for this reason it is important to enquire a little further into the brand name and capability. Tattoo removal lasers vary greatly with inferior copy lasers starting at $5,000, a medical grade laser will cost in excess of $120k. With this in mind, even medical grade technology does vary in capability. One of many examples is to ask if the clinic is using a laser that is able to be set to 3 necessary wavelengths (1064, 532 & 694)? In order for coloured pigment to be directly absorbed by the laser light, multiple wavelengths are required in order to provide complete removal. The Quanta Q-Plus C is an all in one system offering all 3 wavelengths. For other lasers on the market it is important to also ensure the wavelength is ‘true’ and not filtered through a dye hand piece which will ultimately lack the available power needed. 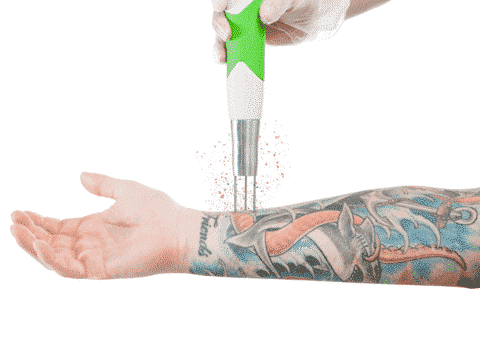 Effective Tattoo Removal depends on 3 active wavelengths. As you can see the PicoSure 755nm wavelength reaches no where near the scale for red inks. Do you need red, yellow, orange or pink ink removed? This is only a VERY recent upgrade offered by Cynosure for the PicoSure laser yet still doesn’t come close to the energy needed for complete removal of these colours. 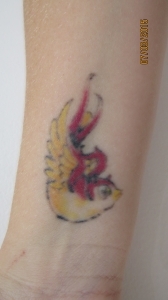 With multiple examples to show, the lowest setting our specialists use for a very light red or yellow tattoo is 2.2 j/cm (already exceeding the limit of the PicoSure). This will then increase over the course of multiple treatments. Something, which the PicoSure dye filter hand piece cannot come close to matching. Another important element to determine a ‘specialist’ is to look at their before and after photos that has been achieved in the clinic. This should give a good idea as to the capability of the laser technology and also the laser technicians who are in operation. Each and every reputable laser manufacturer (such as Quanta Systems) will have ‘stock’ photos to show the effectiveness of their laser system. These photos are provided to a clinic at the point of purchase. When you ask to see a clinics before and after photos, ensure you request to see those they have achieved, not the ‘stock’ photos. Not all laser operators will possess the same amount of training and experience required to successfully and safely gain these results. Our results at Think Again Laser Clinic after only 5 treatments. Lastly education and training will ultimately ensure you are in the hands of a ‘specialist’. The specialists at Think Again are college accredited in Skin Science, they hold the NSW recommended Laser Safety License and they have undergone extensive training with Quanta Systems in the safe operation of the Q-Plus C. Additionally our specialists can confidently guide you through the procedure with first hand knowledge and experience of tattoo removal. Each employee has undergone laser tattoo removal on themselves so you can be assured the information they provide is directly from experience and not only read from a text book. No two tattoos will ever be the same and each will be as individual as the client who has them. For this reason each and every consecutive treatment will be tailored to the client and their tattoo and require a different laser setting and approach every single time. 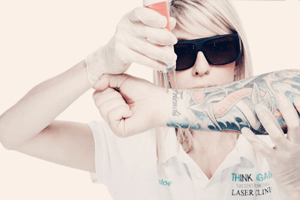 In the 1000’s of treatments performed at Think Again Laser Clinic Sydney, our specialists have gained invaluable experience, knowledge and skill performing laser tattoo removal. Do you have a tattoo you have been considering the removal of? Contact the clinic to schedule a time with our specialists for a free consultation.